Helper class for defining the random vector such that follows the distribution , with a random vector of dimension the dimension of . 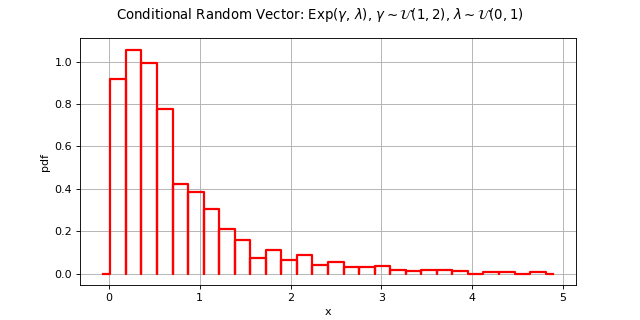 randomParameters : RandomVector, the random parameters of the conditionedDist distribution. with the PDF of the distribution of , where has been replaced by , the PDF of . Note that there exist other (quasi) equivalent modellings using a combination of the classes ConditionalDistribution and RandomVector (see the Use Cases Guide). getDistribution() Accessor to the distribution’s conditioned distribution parameter conditionedDistribution . 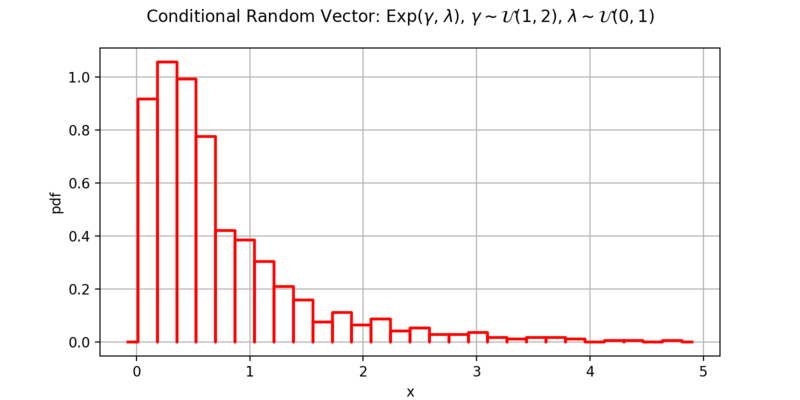 getRandomParameters() Accessor to the distribution’s random parameter randomParameters . getRealization(*args) Compute one realization of the RandomVector. conditionedDistribution : Distribution, the distribution of , where the parameters are equal to the values used to generate the last realization of . Accessor to the distribution’s random parameter randomParameters . randomParameters : RandomVector, the random parameters .